Flowers are carried away from the church after a funeral service for shooting victim Charlotte Bacon, held at Christ the King Lutheran Church in Newtown, Conn. Wednesday, Dec. 19, 2012. Rachel D'Avino died in the Sandy Hook Elementary School shooting in Newtown, Conn. on Friday, Dec. 14, 2012. Funeral Mass for Sandy Hook Elementary School student Olivia Rose Engel at St. Rose of Lima Roman Catholic Church in Newtown, Friday afternoon, Dec. 21, 2012. Mourners leave the Funeral Mass for Sandy Hook Elementary School student Olivia Rose Engel at St. Rose of Lima Roman Catholic Church in Newtown, Friday afternoon, Dec. 21, 2012. The casket of Sandy Hook Elementary School student Olivia Rose Engel is carried into the St. Rose of Lima Roman Catholic Church during the start of her Funeral Mass in Newtown, Friday afternoon, Dec. 21, 2012. Mourners hold hands at the conclusion of the Funeral Mass for Sandy Hook Elementary School student Olivia Rose Engel at St. Rose of Lima Roman Catholic Church in Newtown, Friday afternoon, Dec. 21, 2012. Betsy S. Willson and her daughter Savannah R. Robinson light a candle for Josephine Gay during a vigil in Pearland, Texas Friday, Dec. 21, 2012. Ana Marquez-Greene a victim in the Sandy Hook Elementary School shooting in Newtown, Conn. on Friday Dec. 14, 2012. A funeral service for Dylan Hockley, victim of the Sandy Hook Elementary School shootings last week, is held at Walnut Hill Community Church in Bethel, Conn. Friday, Dec. 21, 2012. People adjust the luminaries on the front lawn of the Munson Lovetere funeral home durng the funeral services of Sandy Hook principal Dawn Lafferty Hochsprung in Woodbury on Wednesday, Dec. 19, 2012. 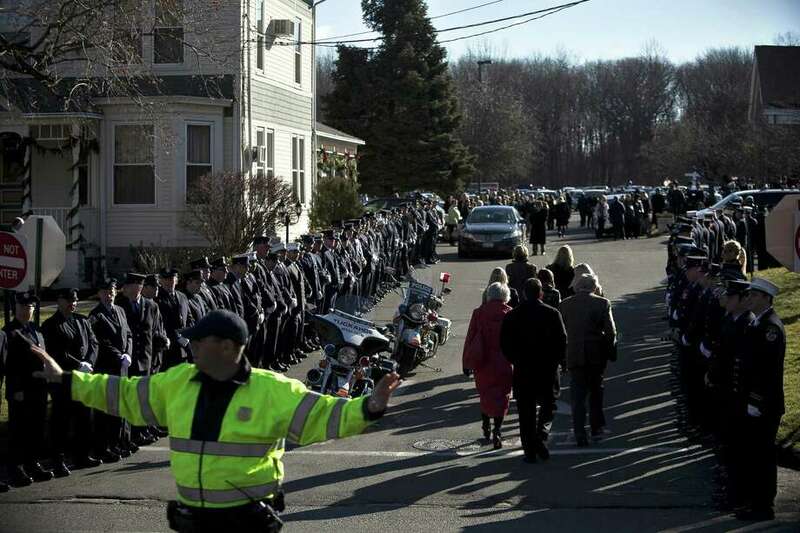 People arrive to the the funeral of Sandy Hook principal Dawn Lafferty Hochsprung at the Munson Lovetere funeral home in Woodbury on Wednesday, Dec. 19, 2012. Madeleine F. Hsu - victim of Sandy Hook Elementary School Massacre in Newtown, Conn. on Friday, Dec. 14, 2012. A Memorial Mass for Grace McDonnell, a student victim of the Newtown shootings, is held Friday, Dec. 21, 2012 at St. Rose of Lima Roman Catholic Church in Newtown, Conn.
Emilie Alice Parker was killed Friday, Dec. 14, 2012, when a gunman opened fire at Sandy Hook Elementary School in Newtown, Conn.
A candle is lit for Emilie Parker during a vigil in Pearland, Texas Friday, Dec. 21, 2012. Funeral services for Caroline Previdi, a student victim of the Newtown shootings, is held Wednesday, Dec. 19, 2012 at St. Rose of Lima Roman Catholic Church in Newtown, Conn.
A mourner pays her respects at a funeral service for shooting victim Lauren Rousseau, Thursday, Dec. 20, 2012, at the First Congregational Church in Danbury, Conn.
Mourners exit the building after the funeral for six year-old Benjamin Andrew Wheeler at Trinity Episcopal Church in Newtown on Thursday, December 20, 2012. Clergy exit the building during the funeral for six year-old Benjamin Andrew Wheeler at Trinity Episcopal Church in Newtown on Thursday, December 20, 2012. Mourners embrace as they arrive for the funeral for Sandy Hook Elementary School student Allison Wyatt which was held at Sacred Heart Roman Catholic Church in Southbury Conn. on Thursday December 20, 2012. A funeral was held for Sandy Hook Elementary School student Allison Wyatt at Sacred Heart Roman Catholic Church in Southbury Conn. on Thursday December 20, 2012.